Like many of you, I stamp when I have time, usually "after hours" (after work, cleaning the house, cooking, gardening, errands and so on), thus the name of this blog. 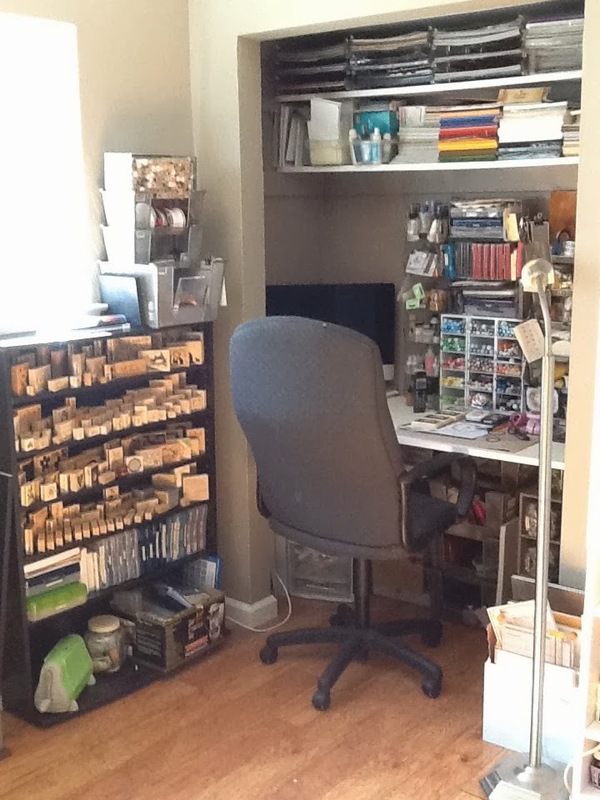 Even looking at my stamping corner draws me over there, and once I sit down and touch even ONE thing, well, soon I find myself up till the wee hours of the morning, and given that rise and shine hour is 6:30 am, exhaustion sets in all too soon. Stamping is an addiction, no doubt or argument can convince me otherwise. Over the years I have collected stamps, inks, equipment and had to search the house for places to stamp. Finally, this year, we created a stamping corner for me, a place within a room that I can go and stamp until I drop : ). Having a place to stamp is really a must have, and while not all of us are blessed with enough space to have our own stamping room, where there is a will, there is a way! I found a great blog online that has a fantastic collection of stamping rooms which made me green with envy! The blog is called CraftyStorage, and you are going to love the crafting rooms shown on this blog! I have to admit I spent about an hour looking at this blog, and I was blown away by the rooms! In a future post we will look at storage ideas for your stamping rooms and areas. There are great products on the market, wonderful ways to create your own storage and of course some fantastic bargains out there as well. This weekend I am going to post a list of supplies for the beginning stamper, things you really should have when you start out, and ways that you can create a small stamping area if you are tight on space.